You won't find an X, Q or Z in the Welsh-language version of Scrabble. But while those letters are missing from the Welsh alphabet, double F and L feature prominently in the latest version of the popular board word game. Scrabble yn Gymraeg (in Welsh) has been released amid hopes it will be popular with native speakers at home and abroad, and learners of the language. Some 2,500 copies of the game have been produced initially, with backing from the Welsh Books Council. 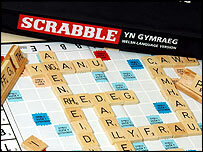 Scrabble maker Mattel describes it as the world's best-selling word game, with 100 million copies sold in 29 languages. Dewi Morris Jones of the Welsh Books Council said the idea had been around for many years to produce a Welsh edition. The council worked closely with Leisure Trends, who have the licence for the game, to come up with the right combination of letters and scores. Computer checks were run on a million words in the University of Wales dictionary of Welsh, as well as 800,000 words in the Welsh Bible. The result was that more common Welsh letters, such as Y and W, are worth only one point. In addition, letters which often appear together such as NG or RH, appear on one tile and are worth 10 points, although the more widely used DD is valued at one point. The highest recorded single word score in English is 392 for CAZIQUES, meaning "native chiefs of West Indian aborigines"
Welsh words often mutate, depending on the context in which they are used. But Mr Morris Jones said that while words which mutate in the middle are allowed in the game, words which have mutated at the start are forbidden. Therefore, for example, Cymraeg (Welsh) is permitted, but its mutated form, Gymraeg, is not. Gymraeg can only be used after a word which causes it to change - for example, yn Gymraeg (in Welsh). But camddefnyddio (misuse) can be used, when it mutates from defnyddio (used). One quirk of the game is that even though J is not formally in the Welsh alphabet, it is in Scrabble, because it is often used in words such as garej (garage) and jambori (jamboree). However, the circumflex seen above letters like "a'" in Siân has been omitted. Its addition changes the meaning of words such as ton (wave) and tôn (tune). "That was quite an issue," said Mr Morris Jones. "As a matter of principle we would have liked to have had it, but its use was so low that it would have cluttered up the game." Mr Morris Jones admitted to having been only a minor Scrabble fan in the past, but he was more likely to play in Welsh. Philip Nelkon, a four-time Scrabble champion, offered useful advice to players - in Welsh or any other language. "Vocabulary is one of the prerequisites, but also there's the ability to be able to see on the rack what you can produce," said Mr Nelkon. "There's also strategy: if you are ahead you play rather differently to if you are behind. If you're winning you are looking to keep the board reasonably closed, if possible. "Also utilise the higher scoring letters for keeping your score ticking over. "With lower scoring letters try to keep them back, which you'll probably be able to use in a seven-letter word."